If there's a flower that heralds spring to me, it's yellow daffodils. I learned to refer to these flower with long noses as daffodils from my Illinois neighbor. Mrs. Futrell had a small white house with a picket fence lined with the small, early yellow flowers growing under old-fashioned lilac bushes. She would walk the fence line with her favorite milk cow and pick bunches for an old piece of broken blue crockery she kept on her kitchen table. Her homemade apple pie never tasted better than after school perched on a chair at that table! After I moved to Missouri, I noticed people where calling what I called daffodils "jonquils." When my yellow "daffodils" are finished blooming, I get a wave of white jonquils. 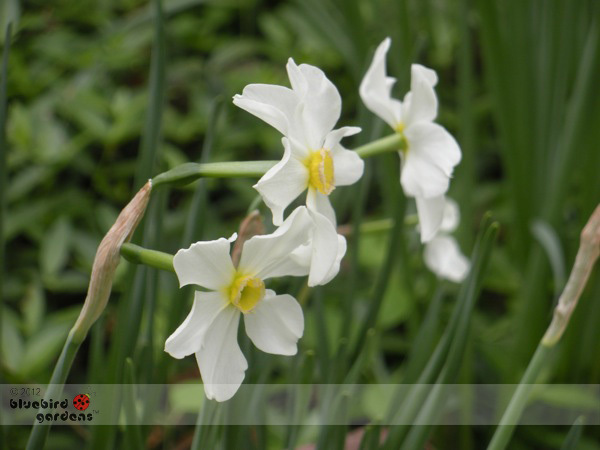 They're distinguished from daffodils by having several flowers on a stem; tube-like leaves, as opposed to flat leaves, and are wonderfully fragrant. When my mother moved to northern Illinois, my visits to Champaign included weekends of landscaping her house. One morning, her neighbor Brenda brought in a bag of loose bulbs and asked if we wanted "narcissus" bulbs. Of course we said yes, then started to wonder what these bulbs were. I had given my mother a pot of "paperwhite narcissus" for Christmas - popular spring bulbs to force in an indoor pot and very fragrant - but the bulbs looked like daffodil bulbs. Not that it makes any difference to anyone, all the flowers are beautiful - but I decided to settle this once and for all. 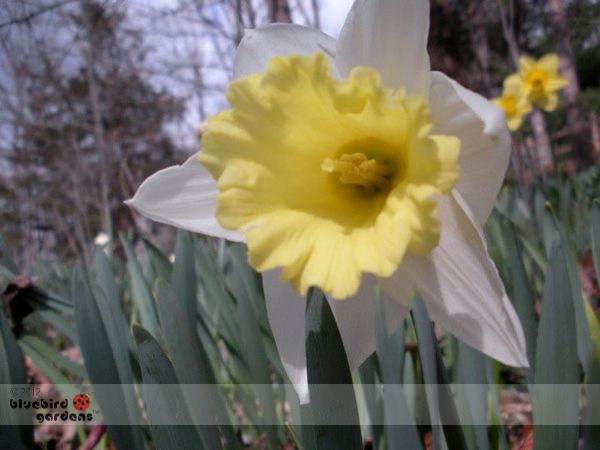 The correct term - drum roll please - is "narcissus," the term for the genus of bulbs that includes daffodils, jonquils, and paperwhites, among many others. One of the gardening books said the "common" term for narcissus is daffodil. By the way, I don't want to get anything started here, narcissus don't really have "noses," that's just what I call the long "cup" at the center surrounded by six petals. What's the Deal About a Trowel?